EDIT 11/5: Heather sent me some information about her line. She is working on the Christmas line now. She's working on 6 colors this time around, some for Christmas, some for winter. She's hoping to have this line finished as early as this weekend, so keep a watchful eye on her Etsy store! Halloween may be over, but there's no reason you can't start preparing for next year, or just get in a few fun manis because the spirit isn't dead in your heart yet. Or maybe it's the living dead because it's Halloween. 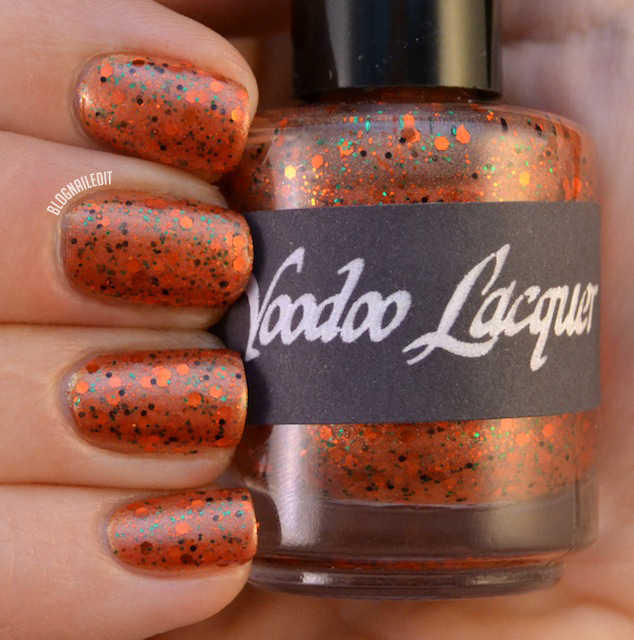 I have a great review tonight of a smaller Etsy seller, VooDoo Lacquers. Though you may not have heard of this Indie brand before, I think you'll like Heather's creations so far. 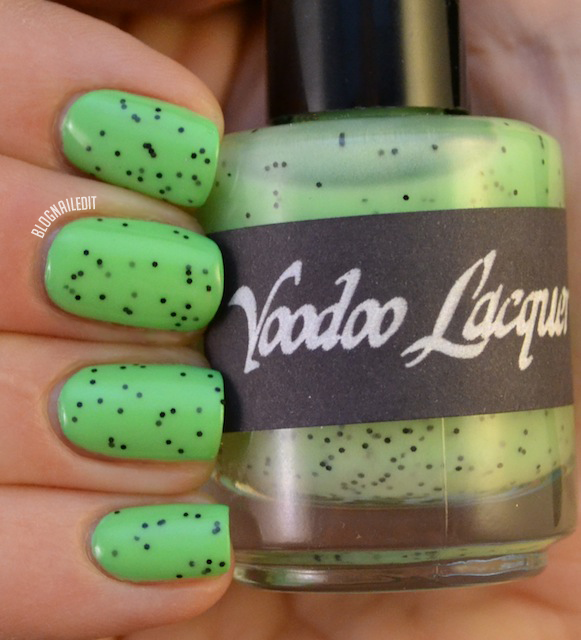 Heather sent four great colors over, three glitters and one glow in the dark neon green (with some glitter). All of these polishes shown require some building to reach a full opacity. They all also have a colorful base, so they're not clear when you apply the first coat. Witches Brew is blue, Pumpkin Head is copper, and Haulin Hearse is charcoal. 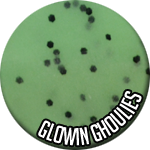 Obviously Glowin Ghoulies is green. I liked the way all of these applied. She did a wonderful job mixing the base and glitters to be easy to apply, but not thin. You can get each of these at her store here at $8.00 per bottle. Haulin Hearse is shown over Decoded (ORLY). There's some great green shimmer in this that shows up nicely in person. I also love the red pieces of glitter that are thrown in among the darker shimmer and silver glitter. Heather sent me a note about this polish that she'd like me to share with everyone. 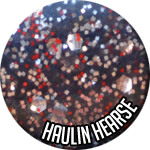 I am aware of the larger silver glitter is slightly curling in Haulin Hearse. I got it from a shop that had high reviews for their glitters not curling or bleeding. But the curl is so slight and they still lay flat, but I won't be using that particular glitter anymore. I have been testing another to see if it curls, it's a tiny bit bigger so hopefully it will hold up, 3 weeks and still no curl. The others seem to have no problems. Witches Brew is shown over Swimsuit...Nailed It! (OPI). 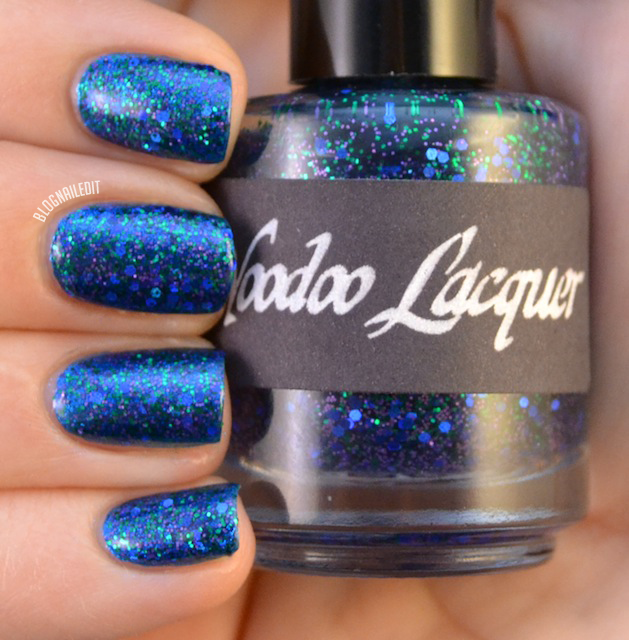 Dark green, almost teal glitter, blue and purple make up this one. Very shiny! This is Pumpkin Head over Rising Star (OPI). I'm not the biggest fan of this one, but that's entirely based on personal taste. There's a lot of metallic in this one. It's the most aptly name too! 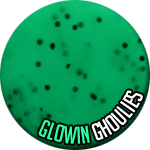 Glowin Ghoulies, shown over Twiggie (Color Club), is my absolute favorite. 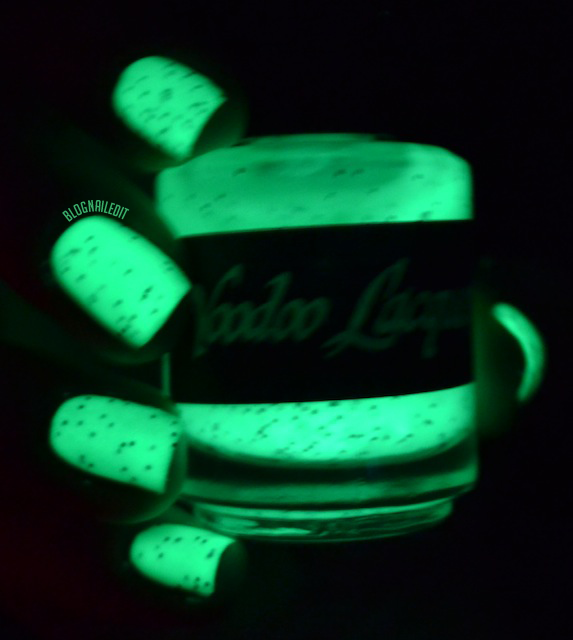 I've seen a lot ads for glow in the dark polishes, and I never believed any of them. I loved this one as soon as I opened her package though. Then, when I stuck it under direct light for about a minute, I was blown away by how vividly it was glowing! I'm not kidding! I turned off all the lights and just let my hands guide the way. 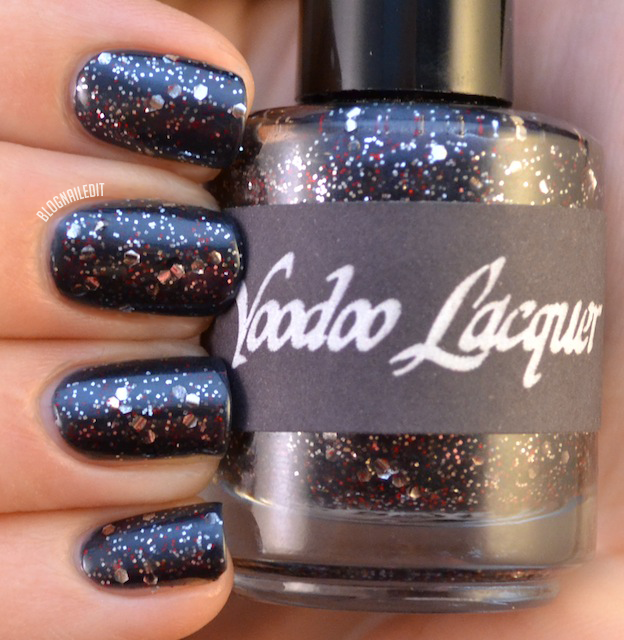 This polish is a must have, especially with its little bits of black glitter. It's scary good! Obviously, this one needed some nail art on it, so what transpired was this spooky scene. Aliens, bats, stitches and jack o' lantern faces. Check it out when it glows! Unreal right?! You can see my skin glowing from the polish. Show Heather some love so she'll make us some more great colors! 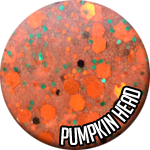 Christmas is right around the corner, and I'm betting there's suddenly low stock of green and red glitter! That is some ridiculously bright glowing! These all look fantastic. Great swatches! That glow in the dark is awesome! Those are some great swatches, thanks for sharing! Witches brew - TEH PURDY! Glowin' Ghloulies is AWESOME! Glow in the dark is epic. 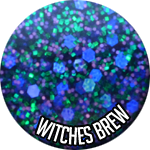 I also loved Witch's Brew's color. That blue-green is now suddenly needed. Wow, that glow is amazing! What great polishes! WOW! That glow polish is potent! Hahaha I really like Haulin Hearse though. 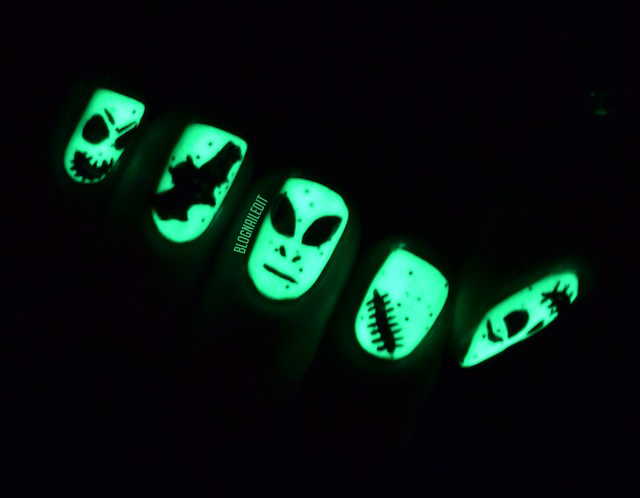 Those glow in the dark nails are amazing! Their nail polish is seriously adorable. I love them! 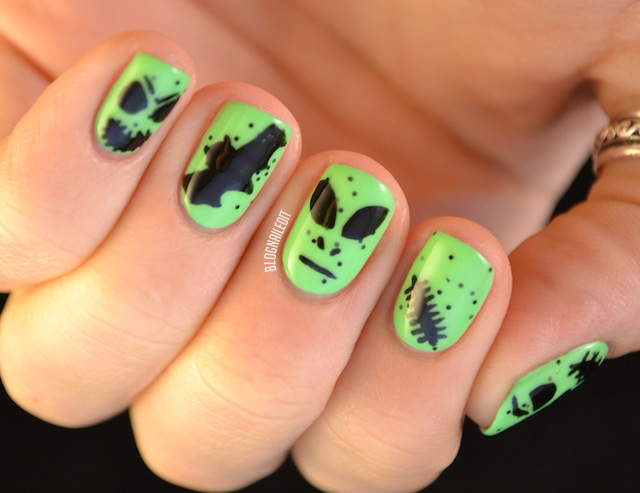 That glow is amaaazing and with the nail art it's just brilliant!